North Coast Village condo, beach resort home in Oceanside. This exquisite remodel is Tommy Bahama's personal beach get-away on the Pacific;)! The to-die-for kitchen has cherry cabinets, gorgeous granite counter tops, stainless steel appliances, stone flooring, and is fully equipped for the finest chef. The cozy yet elegant living area has a stone fireplace and flat screen smart television with DVD, and a queen size pillow top hide-a-bed. It opens to a balcony overlooking the lush tropical grounds of North Coast Village and its beautiful evening lights. The first floor guest suite features a walk-in travertine shower, travertine floors, and granite/cherry vanity. Get ready for breathtaking ocean views as you enter extra large 13x30 luxurious master suite. The sitting area with two leather Barcalounger swivel recliners enable you to gaze out at the ocean, or turn around and enjoy viewing yet another flat screen television with DVD also a smart tv. This 2nd level master suite, unlike most in North Coast Village, is completely private with a locking door. The crowning glory of this home-away-from-home is the large, wrap-around roof top balcony that surrounds the master suite. Furnished with a large oval table (seating 6) and a high rise table (seating 4), both with umbrellas. There are also two chaise loungers for sunning and relaxing. This is an outdoor room with a spectacular ocean view both directly west as well as south to the pier. You will feel like you are above it all in your own private tropical paradise retreat! North Coast Village is located between the Oceanside Harbor and the Oceanside Pier, and is a favorite vacation destination for couples and families from all over the world. The complex consists of nine three-story buildings on acres of beautifully landscaped grounds. You are just steps from the sand; there are no roads to cross-this is an OCEANFRONT COMPLEX! Swim in the Olympic size heated pool (one of two pools and spas), or enjoy a romantic walk on one of the most beautiful stretches of beach in Southern California. Stroll around the lush tropical grounds with streams, waterfalls, Koi ponds, and beautiful gardens. In the evening, gorgeous colored lights create a magical atmosphere. 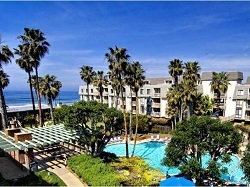 North Coast Village Condo Rental in Oceanside CA.